Hello and welcome to exampundit. 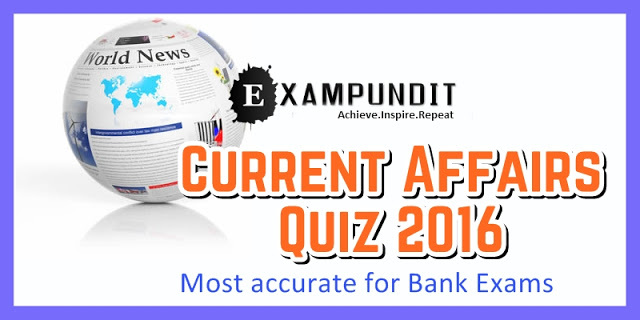 Here is the first set of Financial Current Affairs Questions for the upcoming UBI PO and RBI Grade B 2016. These are based on the Current Affairs from July, 2016 last week. The topics include, news related to finance, industry, MoU, investments, reports related to economy and all the financial awareness. asset management company and a trustee company? rank in Sustainable Development Goal Index 2016? following organisations released the Sustainable Development Goal Index 2016? line of credit did India recently approve for Sri Lanka’s railway improvement? for urban poor under Pradhan Mantri Awas Yojana (Urban)? (KSK) as Business Correspondents (BCs)? of Indian Oil Corporation in the 2016 Fortune Global 500 list? of grant did Government approve for Jammu and Kashmir under skill development initiative ‘Himayat’?